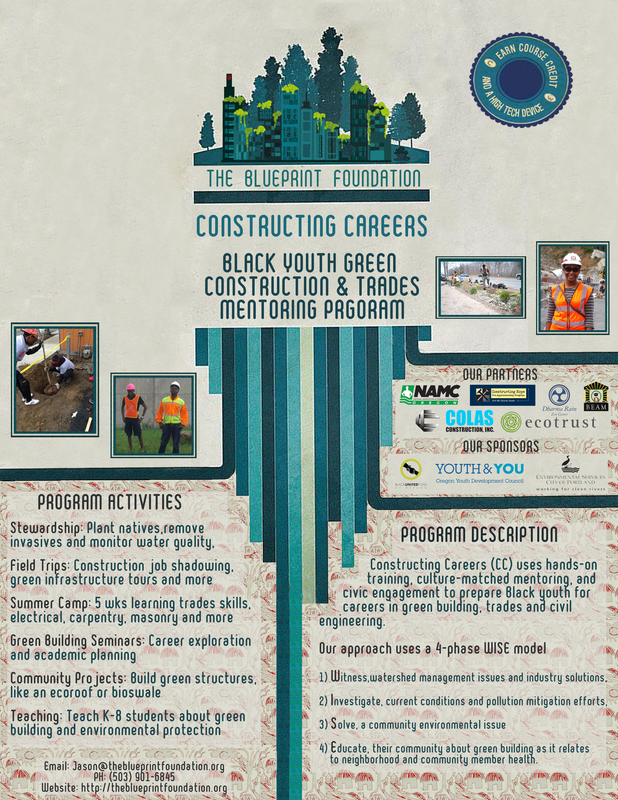 Constructing Careers is the second discipline-specific mentoring program offered by The Blueprint Foundation using funding from the Black United Fund, Oregon Department of Education Youth Development Council, and City of Portland's Community Watershed Stewardship Program. In this program, students learn about careers in green building, trades, and civil engineering while taking an active role in environmental stewardship. Professional and college student mentors of color join students on field trips to construction sites, green infrastructure tours, and wildlife areas. Awareness of the impact green infrastructure has on the health and beauty of their neighborhood. Constructing Careers (CC) uses hands-on training, culture-matched mentoring, and civic engagement to prepare Black youth for careers in green building, trades and civil engineering.